A Norwegian research team in Antarctica discovers an alien spacecraft leading to a confrontation they never imagined. "The Thing" may share the same name and creature as the 1982 John Carpenter movie, but it does not share the same structure of horror. The prequel directed by Matthijs van Heijningen Jr. is an all out monster movie whereas John Carpenter's film is more of a cliffhanger. To be more specific, Carpenter's version thrived off keeping the audience guessing, where this time, the audience knows where the alien is for nearly the entire ride. The switch to a monster-attack movie versus a whodunit never allowed any real sense of paranoia to set in between the characters or the audience for that matter. The tagline of the the prequel is "it's not human, yet," which I find to be telling in the overall sense of what I got from the alien. Being a prequel, we see a unwiser version of the Thing. In John Carpenter's 1982 film, the alien or Thing is trying to remain anonymous in order to survive, but here we see a Thing that is far less stealth about its replication process. The Thing spends a majority of the film out in the open mimicking multiple forms at once. By the end of the film, the Thing has learned that it must be more concealing if it is going to survive and spread. Much of this is rationalization however comes after the fact of watching the film, meanwhile during the 103 minute horror, I was left thinking why does this advanced life form seem so much less-intelligent? 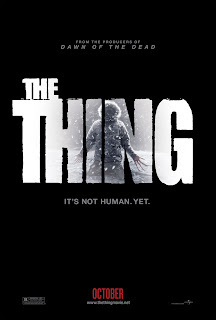 Much of the blame could be placed on the filmmakers who believed that advances in cgi could allow for more elaborate mutations of the Thing, but truth be told, the practical and special effects used in the 1982 film are more haunting and scary than the detailed cgi monsters within this 2011 prequel. Most of the cgi on display felt unnecessary. One example is the form that is excavated by the American team from the Norwegian base in John Carpenter's 1982 film. This prequel makes sure to deliver setup to how that Thing was left burned to be later taken by the American team but it also creates a lengthy chase sequence that is reminiscent of a Velociraptor scene set in the kitchen from Steven Spielberg's "Jurassic Park." Much of the movie takes on this attack mode that I really didn't enjoy or expect. The audience is subjected to multiple sequences with the Thing just destroying and attacking every human left unharmed instead being sleuth about its actions and trying to escape unnoticed. "The Thing" actually does a decent job of being a prequel to John Carpenter's 1982 film in the sense that it sets up what we already knew, however I wish the film was brave enough to be completely about the Norwegian team and their discovery. The movie opens this way complete with subtitles but the plot quickly finds a way to include a host of American characters to the story. Conveniently enough, all of the Norwegians also speak perfect English once the Americans have arrived. This development felt like a screenwriting cop out as well as not having faith American audiences would watch a horror movie with subtitles. The one bright side to Americanized shift is a strong female main character, although that doesn't replace the fact "The Thing" is plagued with an abundance of characters that the audience is never allowed time to connect with. The biggest missing ingredient in "The Thing" is terror. There is never any true sense of fear. Director Matthijs van Heijningen Jr. made a creative decision to go for jump scares instead of unsettling fear of the unknown and that was a mistake. The film had a perfect opportunity to create a scary new chapter in the saga of the Thing from another world but missed the mark in a big way. Sadly, the best thing about the 2011 prequel is that it does an awesome job of closing the film with the opening to the 1982 masterpiece by John Carpenter.